This week in the journal Nature, a worldwide team of 75 scientists revealed the genetic blueprint of the one-celled alga Emiliania huxleyi, which may be the most important species you've never heard of. The genomes of the domestic dog and cat are interesting, but the E. huxleyi genome is a much bigger story. Some day this organism may become another of our partner species, as vital to us as yeast. Oceanographers of all kinds know Emiliania huxleyi by the nickname "Ehux," and that's what I'll call it too. Among the marine algae, Ehux is classified as a coccolithophore, so named because it builds loose shells around itself made of coccoliths. Coccoliths, in turn, are the intricate disks seen in the photo above at high magnification. The fate of Earth's changing climate may ride on coccoliths. In the world's atmospheric carbon cycle, the ocean is ultimately in charge. And in the ocean's carbon cycle, Ehux is a keystone species. To make coccoliths, Ehux takes carbon dioxide dissolved in seawater and combines it with calcium ions in the water to make calcium carbonate (the mineral calcite), somehow rendering its spiky crystals into shapes elegant enough to inspire new forms of pasta. CO2 from the air replaces what's removed from the seawater. Coccolithophores are the single largest producer of biogenic calcium carbonate on Earth, and Ehux is their leading species. Ehux grows in every part of the ocean except around the frozen poles. It's prone to enormous bloomsbursts of reproduction that may cover areas as large as California. Ehux blooms, with their uncountable numbers of coccoliths, reflect so much light that they turn the water a milky blue that is easily monitored by satellites. Shed coccoliths drift down to the seafloor, and in favorable times in the geologic past they have formed beds of chalk. (The climax era of the dinosaurs, the Cretaceous Period, got its name from the thick chalk beds of Europe.) 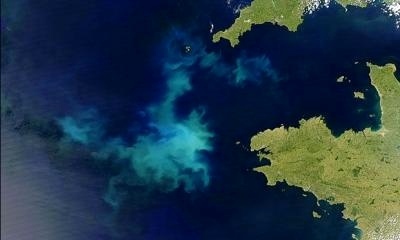 Chalk, and the coccoliths that compose it, represent carbon removed from the atmosphere. Another special skill of Ehux is turning sulfur compounds into the gas dimethyl sulfide, a major ingredient in the formation of sea clouds. Its dual roles in cloud formation and CO2 regulation put Ehux at the crux of global climate. As atmospheric carbon dioxide rises today we need to learn, as fast as possible, exactly how nature handles it. The open-access Nature paper promises to put our hands on Ehux's genetic toolkit. What can we do with that? The possible benefits range from pure science to pure technology. Emiliania huxleyi's genome turns out to be as big as that of a full-grown land plant, at 141 million bases. That's one reason the gene-mapping project took ten years. Another reason is that the genome is an extraordinarily diverse "pan genome," with a core set of genes and a large set of optional ones suited to particular environments. The pan genome enables Ehux to cope with a wide range of limiting conditions like low nutrient levels and strong ultraviolet radiation. The research team found that Ehux strains in different oceans were less than 80 percent similarcompare that to humans, who are 99 percent similar around the world. This is the first pan genome found outside bacteria. And Ehux may also be as adept as bacteria at gene-swapping. These factors make Ehux extremely adaptable and account for its worldwide abundance. We can make use of genes that control so many things. "E. huxleyi synthesizes unusual lipids that are used as nutritional/feedstock supplements, polymer precursors and petrochemical replacements," the authors note. If we are to master the science of making biofuels and sustainable plastics from algae, we must domesticate Ehux or a species like it. Perhaps we can also train it to build nanostructures other than coccoliths, with possible applications that include optical-electronic technology and medicine. The Nature paper, "Pan genome of the phytoplankton Emiliania underpins its global distribution," is available in full to all readers. It is thick reading, but dense with meaning and promise. The name Emiliania huxleyi honors achievements of two great polymaths in Earth science: Cesare Emiliani (19221995), founder of paleoclimatology, and Thomas Henry Huxley (18251895), discoverer of coccoliths. Learn more about Ehux at the Ehux home page. Several California institutions were part of this effort, most notably the Department of Energy's Joint Genome Institute in Walnut Creek. Others included Cal State San Marcos, the Craig Venter Institute, Monterey Bay Aquarium Research Institute, UC Santa Barbara and Cal State Chico.